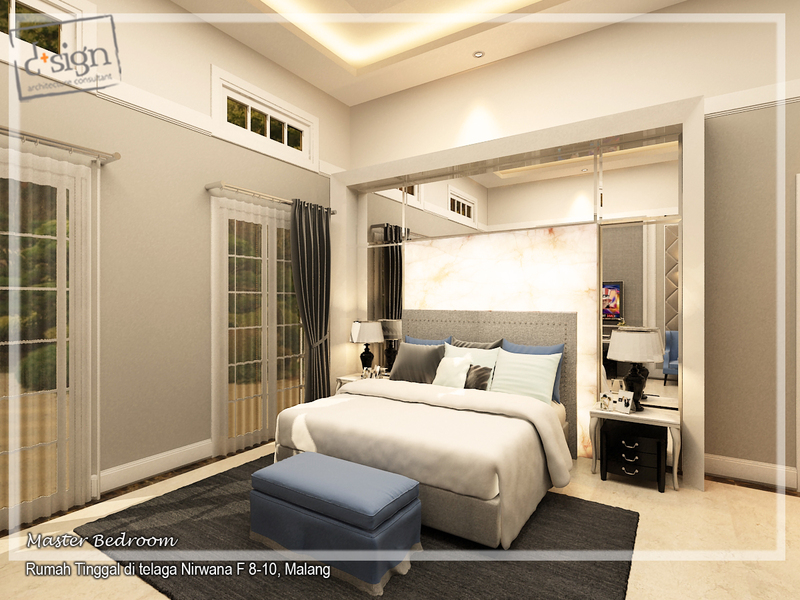 Located in the heart of Malang, East Java, Ijen Nirwana is an exclusive housing complex aiming for middle up segment. This particular project is quite large in measure. Built on around 3000 m2 area with more than 1000 m2 building area, this residence consist of 3 buildings, Main House, Guest House and Service House. 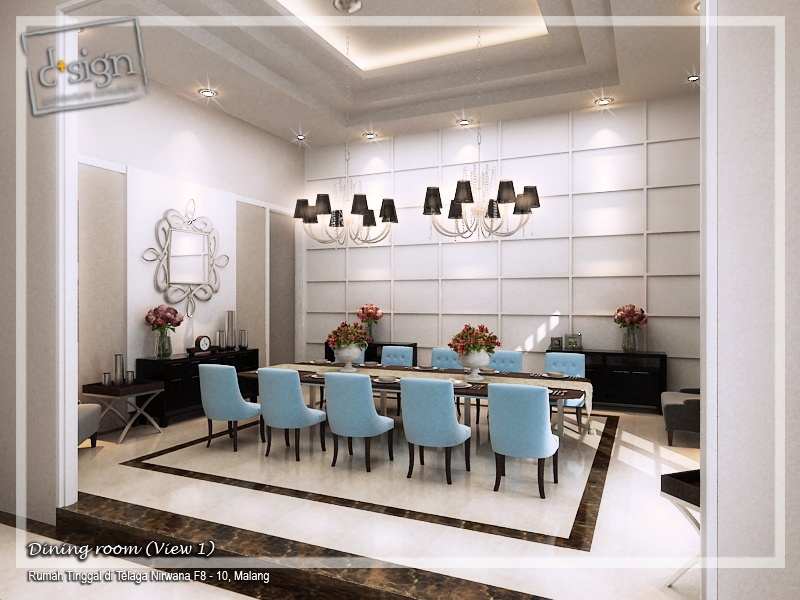 In this project I had the opportunity to do the whole architectural and interior design. 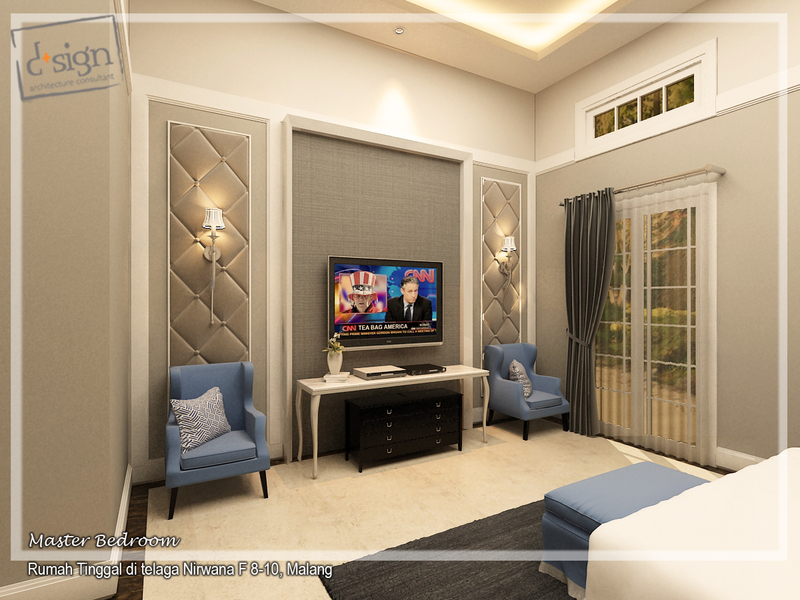 For interior, I design the Main House and the Guest House area. 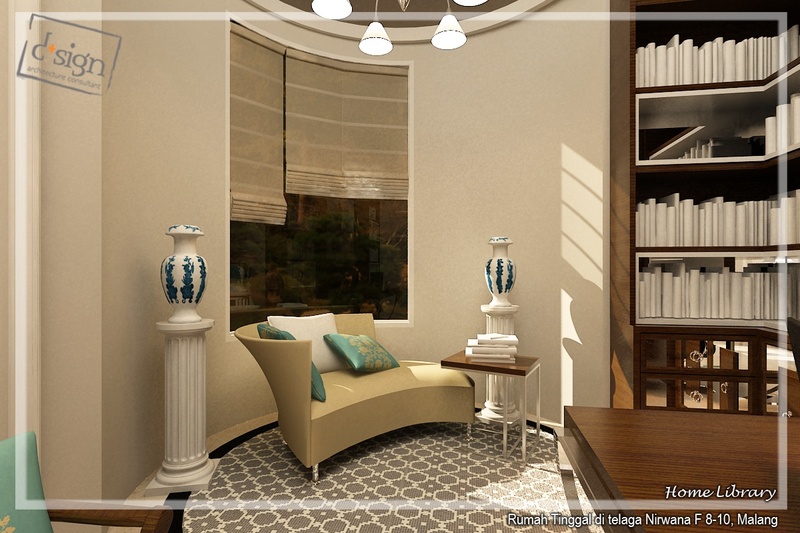 In the beginning of the project, the owner asked us to design something with colonial style and yet giving it a more modern look. So we adopted the large opening, bouvenlicht windows, high ceiling, long corridor alongside the building, thick walls, and combine it with more modern materials such as travertine exterior walls, glass roof corridor and alluminium frame for doors and windows. One of the main challenge during the architectural design is that this residence had to follow a certain fengshui arrangement, limiting the placement of the entrance, bedrooms, and kitchen. Main house and guest house also have to be independent, having their own plumbing, mechanical – electrical, and air conditioning system.While on the interior, I decided to differentiate the concept of the Main House and Guest House design. For the Guest House, I designed it with a more hotel-like function, for short time occupants, while the Main House is designed to live in. Let’s focus with the Main House shall we? The Main House should accommodate 5 family members, the parents and their 3 kids. Calculated according to fengshui, every bedroom is placed on certain area of the house according to the birth date calculation of the occupants. A very unique arrangement indeed. In the main house, I want to design something elegant yet very cozy, so lots of earth tone colour and pastels are used. 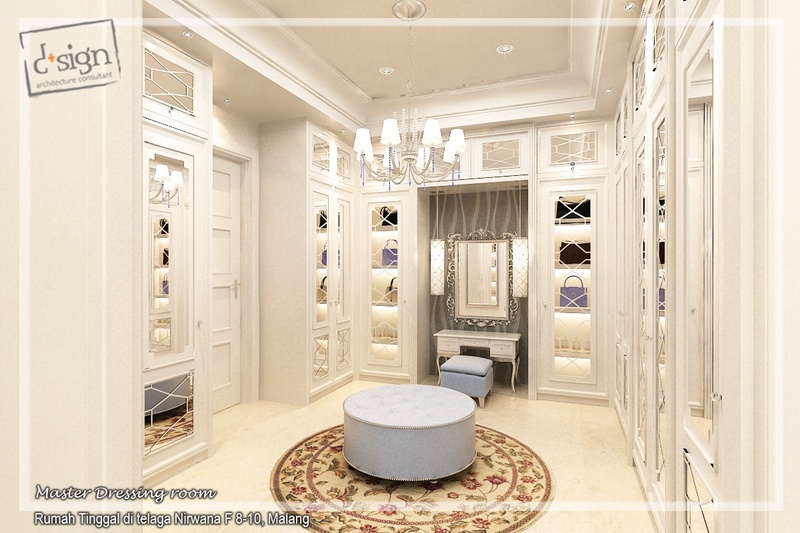 Entering the foyer, we are plunged into a grandeur ambience of the house with its high ceiling and large mirror panels. 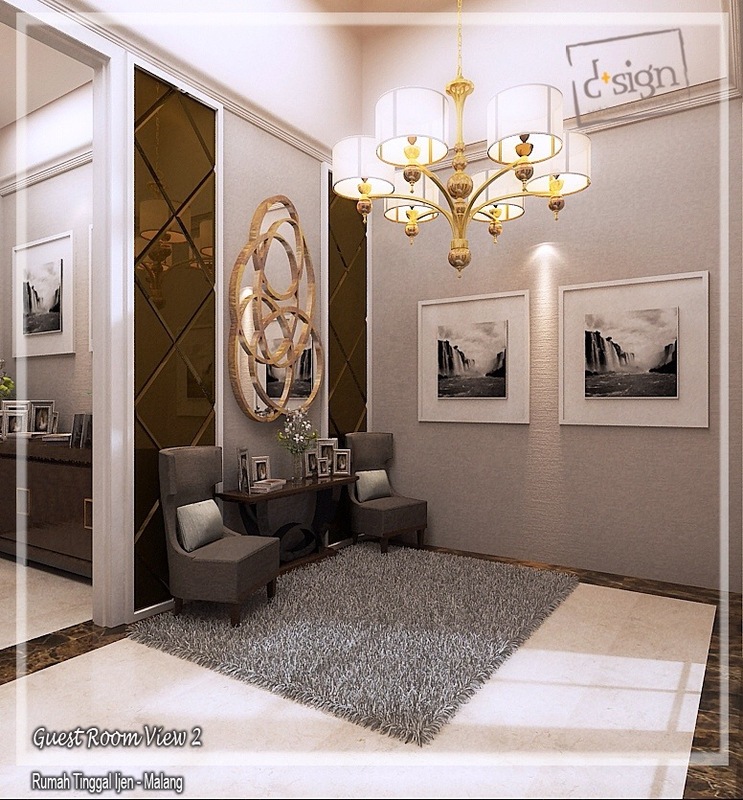 Simple furniture with curving details and elegant chandeliers give it a more fluid and homey feeling. Having high ceiling and big openings gives this house a great ventilation, great air quality and comfortable temperature, but interior wise, high 4 to 4.5 meters ceilings gives a building a more aloof ambience. 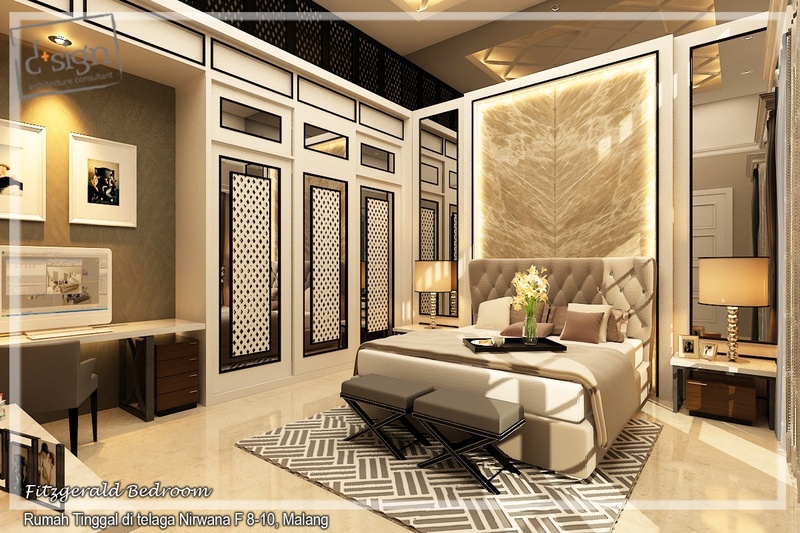 So in order to maintain a homey, down to earth concept, I decided to add GRC border in every interior wall, on 3 meters height, manipulating the rooms’ actual height. 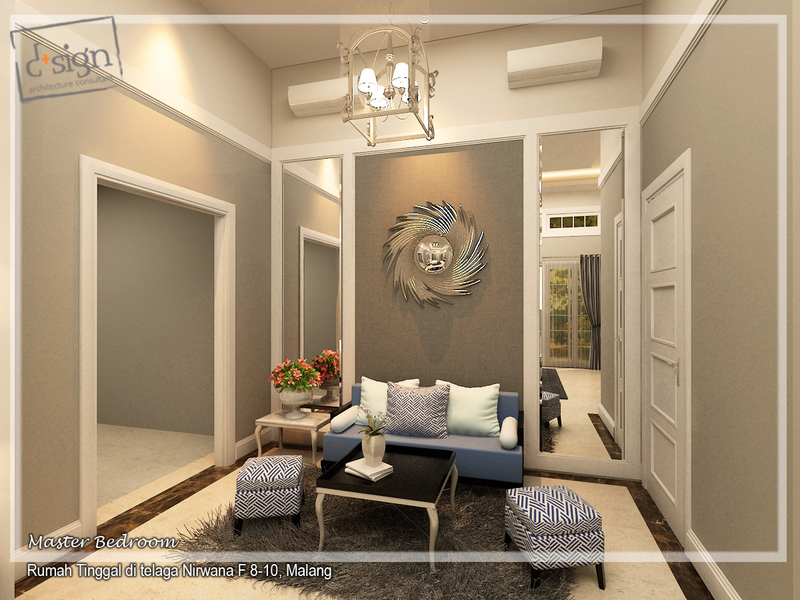 Heading to the living room, we are welcomed by an arrangement of beige oversized sofas with soft blue cushions and blue antique chinoseries side lamps. Enormous flat screen TV is attached to the travertine wall, while blind in mirror panels on its sides hiding doors to the home theater room and to the next building. Dominated by a solid PU finished teakwood furniture and arm chairs,this room never loose its warmth as well as its elegance. Stepping from living to dining area, we are separated by one step floor level difference. 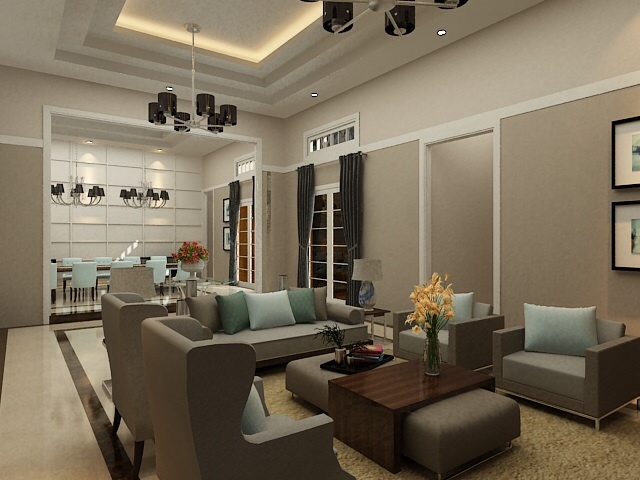 Every transition in the semi public area from guest room and foyer to living and dining area is emphasized by opening, different level of ceilings and floor border endings. Giving it a significant difference from one area to another and yet maintaining the movement fluidity. 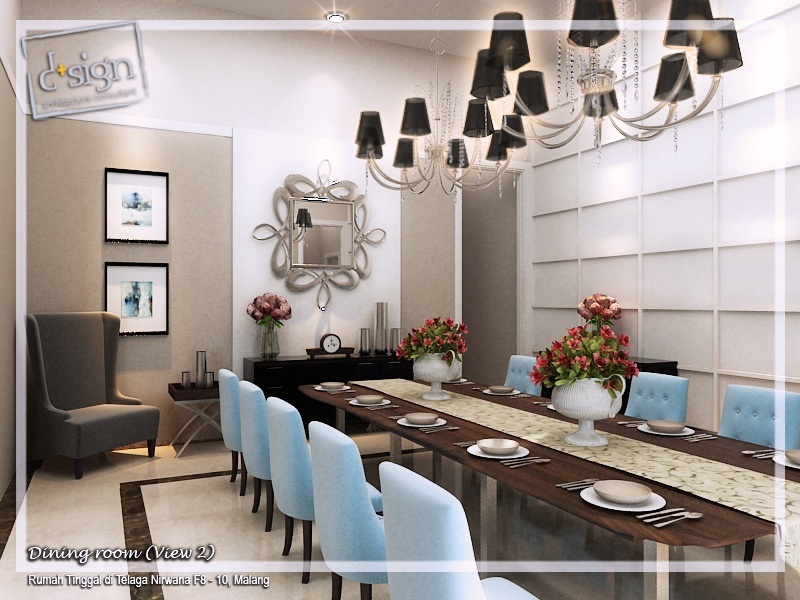 Dining area is designed to accommodate 10 people with solid wood dining table at its center. Several armchairs are located in the corner of the room for a closure of the whole arrangement. Next to the dining room is the kitchen, with the door hidden from the dining area by blind in panel attached along the dining room wall. 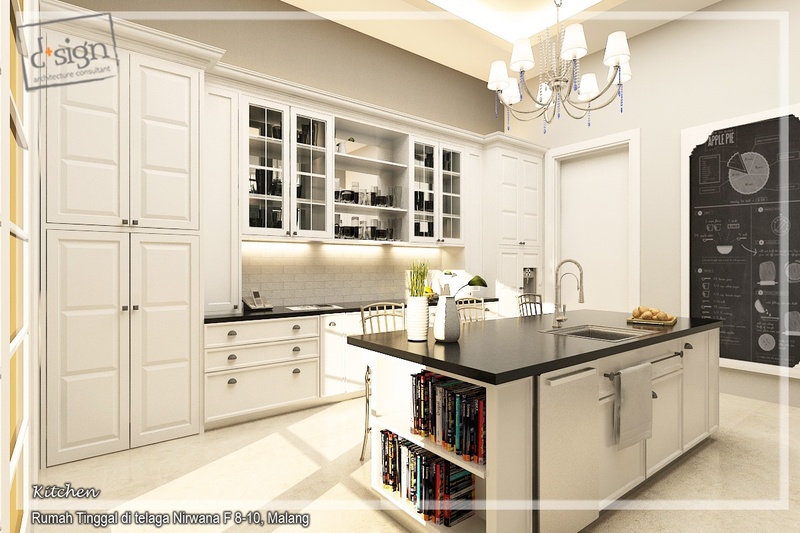 The kitchen itself is quite spacious and cozy, suitable for family breakfast time. 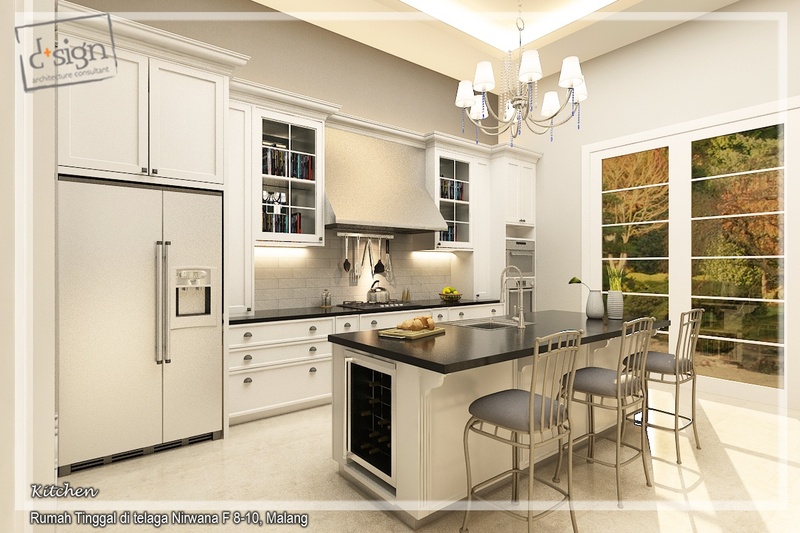 Equipped with high end kitchen appliances, this white dominated kitchen has vintage touch in it. From the rustic metal handle, old school blackboard for today’s menu and kids gallery, vintage cooker hood and breakfast stools to the whole classic look of the kitchen cabinet. A double door opening gives this kitchen a great access to natural light during the day. Make it a perfect spot to have breakfast, to have leisure cooking activity or to spend a quiet time reading while having some midday snack. 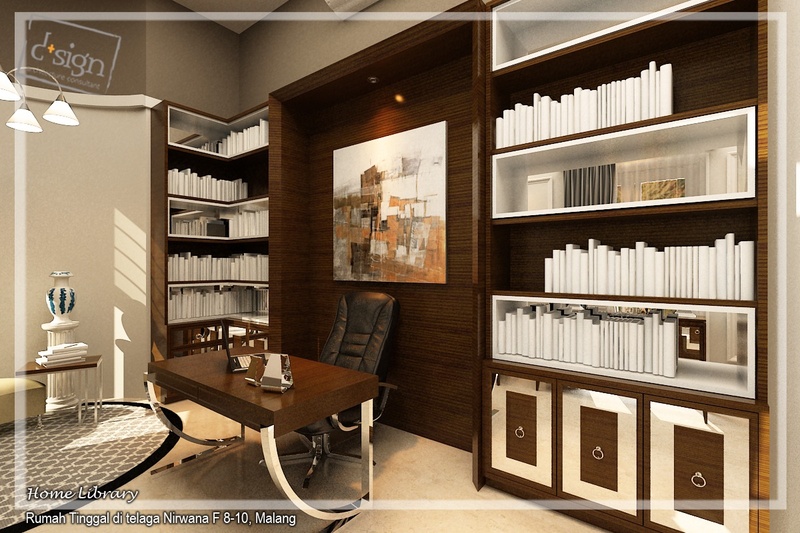 The library, designed with a more sturdy look, lined with racks of books, a stylish working desk, cabinet and several armchairs across the desk. A rounded corner of the room with daybed overlooking the windows with a view to the garden giving a more relaxing and private space for casual reading. 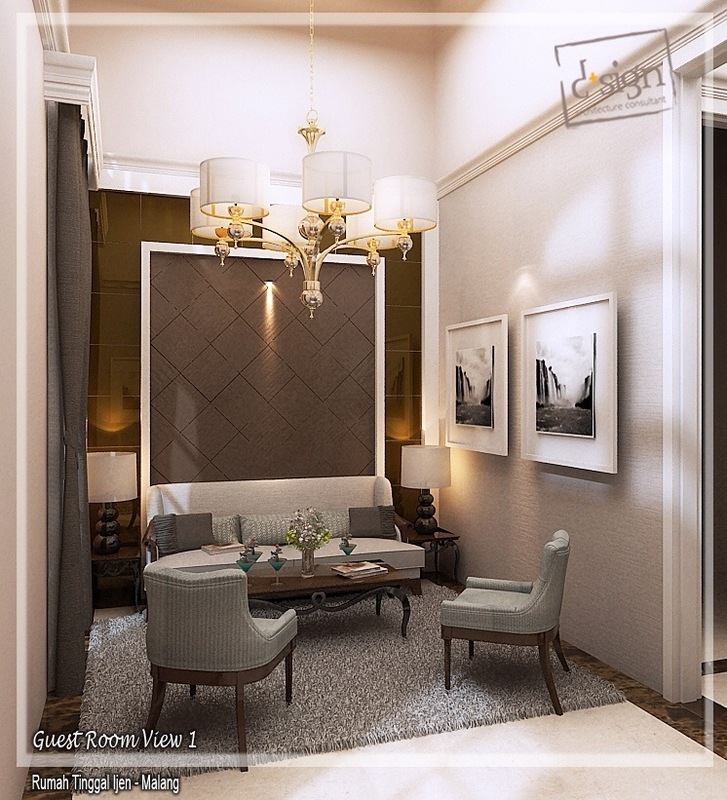 Several antique chinoseries are placed in this room as integrated details with the more communal areas of the house, like dining and living room. The main house itself has 1 master bedroom and 3 children bedrooms. 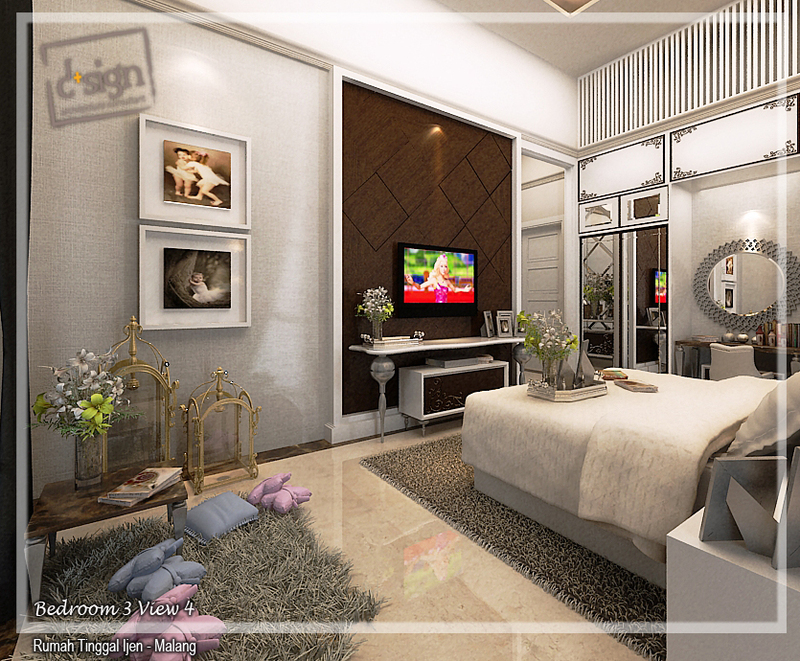 Each has common traits of theme, color and material with different design, giving each bedroom a character of its own. 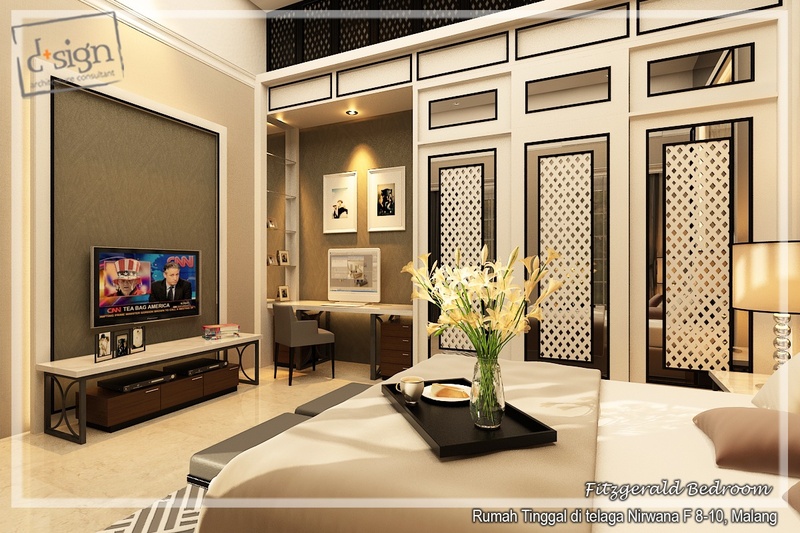 The master bedroom is spacious, consisting of sitting and bedroom area, dressing room and the master bathroom. Giving it a more relaxing ambience and accentuate its spaciousness, we try to use less furniture in the room. 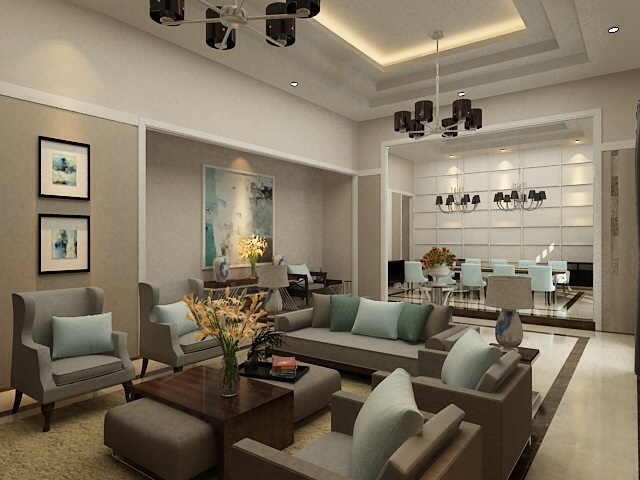 More light blue tone is applied in this design for calming and relaxing effect. 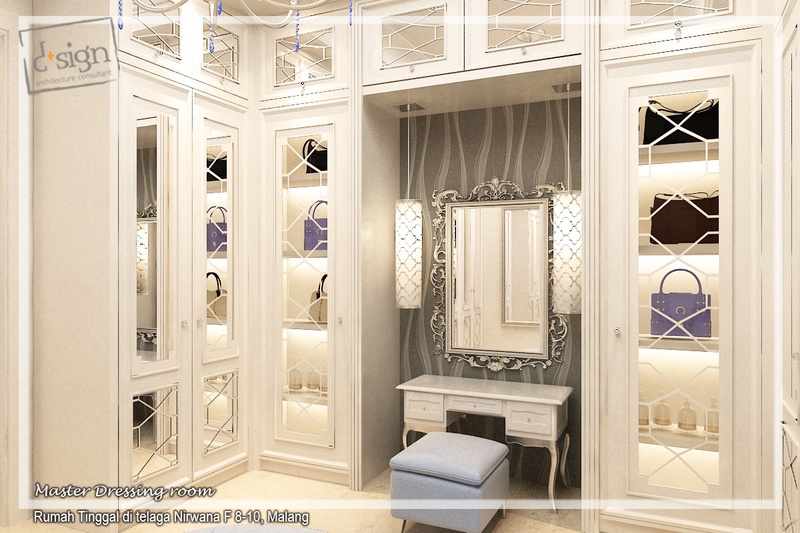 The dressing room is dominated with white for a clean and neat look. Hints of light blue round ottoman, puff, and blue crystal from the chandelier connect this dressing to the bedroom. The children bedrooms share the same colour theme, which is white, grey, wood brown and cream. 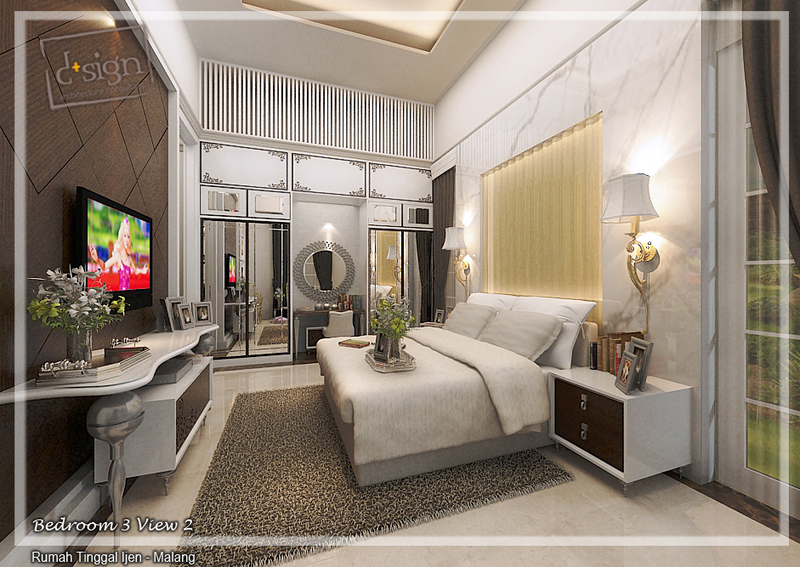 Each bedroom has built in wardrobe and desk. While the boys’ bedrooms used a darker, solid wood texture and rustic finished iron plate for the furniture support, the girl bedroom has lighter ambience with more curving details, elegant decorative mirrors and lounging corner with plush pillows and coffee table. This entry was tagged diahindawatie, dplussign, interior design, residence, www.dplussign.com. Bookmark the permalink.